November began with another holiday, បុណ្យអុំទូក (Bon Om Touk) or the Water Festival. The festival celebrates the end of the rainy season and the reversal of the Tonle Sap River. Boat races are held in Phnom Penh along the river. Many people living in the provinces come to Phnom Penh to join in on the celebrations. 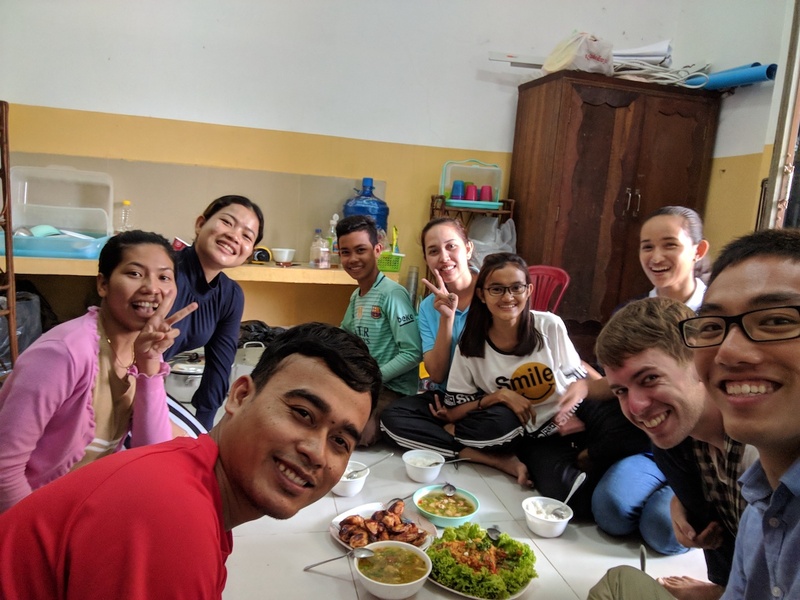 I decided to avoid the crowd and instead went on a short vacation to Sihanoukville with Nate, my housemate and fellow Serve Asia worker. I’m thankful for the opportunity to rest and enjoy God’s creation. 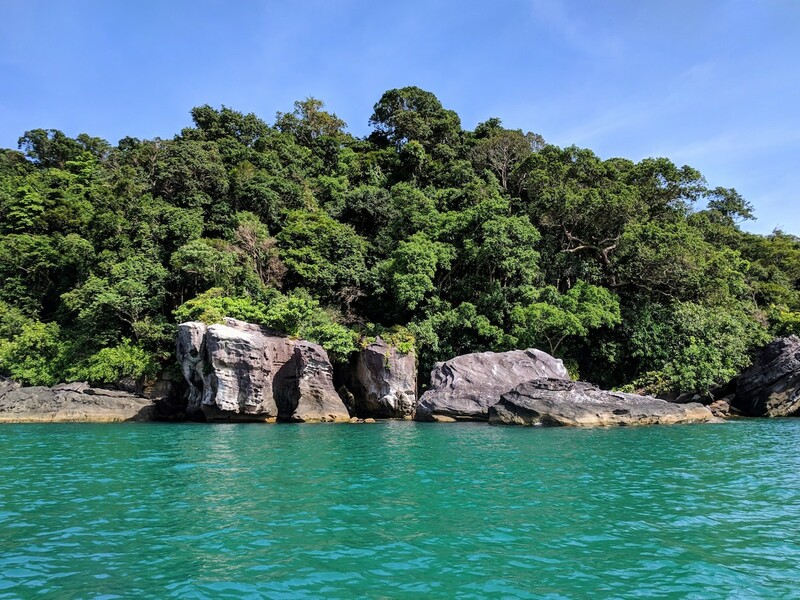 An island we visited during a boat tour in Sihanoukville. There’s also lots of beautiful coral and fish that can be seen when snorkeling. I’m also thankful for church. I’ve been regularly attending a small Khmer church on Sunday mornings. The church is quite small—each week we usually have just under 10 people at the adult service. The worship style is a bit different than at larger churches that I’ve attended in the past. We worship together sitting around a table instead of in rows of chairs. During the service, we share prayer requests and how we see God at work and pray together for each other. Afterwards, we usually will cook lunch together. I’m really enjoying getting to know my Khmer brothers and sisters at church. It’s such a blessing that we are all one body! 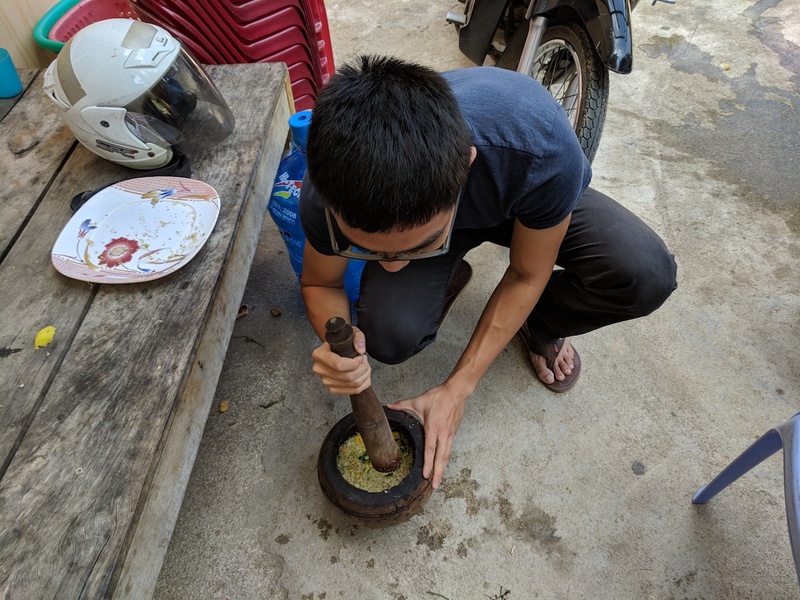 Grinding herbs to make ប្រហុកខ្ទិះ (Prahok Khtis), a dish of fish paste and pork pork served with fresh vegetables. Eating a home-cooked meal after church! After Khmer church on Sundays, I go to an English church in the evening. I love my Khmer church, but I feel a need to refresh my soul by singing praise to God and hearing God’s word in my native language. I’ve also had the chance to serve at my English church, helping lead musical worship and teaching the kids at Sunday school. Software development with SIL has been progressing well. We recently had a new iOS developer join the team remotely. Praise God for that! This past month, I’ve continued behind-the-scenes work to improve the maintainability and stability of the iOS app. I recently started working on a feature that allows the iOS app to read a new keyboard distribution format. Please pray for strength and wisdom to faithfully finish off my remaining three weeks. Coming to Cambodia has given me better perspective on missions and what being a long-term missionary would potentially be like. As I reflect on my time here, I feel an increasing conviction to pray for more workers. I especially think of UWCCF, my university fellowship in Canada. I pray that God would call some to go and that He would use me to encourage others to have a heart for missions. Since a lot of UW students are in computer-related fields, I hope to connect them with my team at SIL or other missions organizations that require software skills. Thank you for all your support and prayer! Please pray for health and safety in my remaining time here and that God will continue to do His work here.